This is the NextWave from Lonely Whale on Vimeo. This phenomenon is gaining momentum over time. If nothing is done, 150 million tons of plastics will pollute the seas by 2025. The threat is real for vital marine ecosystems, especially for fish reproduction, coral reefs and, more broadly, for the health of all species inhabiting the seas and the Earth. 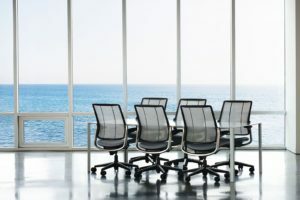 Dell Inc., General Motors ™, Microsoft ™, Trek Bicycle ™, Interface ™, Van de Sant ™, Humanscale ™, Bureo ™ and Herman Miller ™ have decided to join forces as part of NextWave, an open collaborative initiative. NextWave’s goal is for its member players to create the first supply chain using plastics collected in marine environments or on beaches. Bureo, in particular, recycles plastic into skateboarding tablets, sunglasses and other products. Members of the NextWave ™ consortium will share the responsibility for developing an eco-responsible model that limits the plastic pollution of the oceans, while having economic and social benefits for the various stakeholders. The group will have to put in place the necessary infrastructure for this supply chain and the ad hoc support to meet the demand while complying with the environmental and social standards in force. Finally, the initiative will verify the integrity of the supply chain and the integration of products, through third-party compliance checks and external impact audits. Lonely Whale ™, an NGO that works to bring men closer to the oceans, particularly through educational campaigns for young people and information campaigns, will assist the consortium. NextWave intends to work actively with scientists and marine conservationists to develop its eco-friendly business model that meets the needs of people and coastal environments. Future private sector partners are invited to sign, as proof of their formal commitment, the clean seas oceans campaign. With its action, NextWave ho pes to avoid more than 1.3 million kilos of plastics to finish in the oceans in the next 5 years, the equivalent of 66 million plastic bottles. Consortium member companies are all committed to reducing the use of plastics at their production sites and at all stages of their supply chain. To stem the continual flow of plastics ending their life in the oceans, each actor must make sure to reduce their own plastic footprint and eliminate or greatly limit their use of new single-use and non-recyclable plastics. Humanscale :Smart Ocean chair The incarnation of Humanscale’s commitment to sustainable manufacturing, Smart Ocean incorporates almost 2 pounds of recycled NetPlus material. This is the first ergonomic chair built with this recycled material. 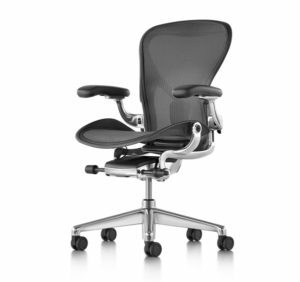 Herman MILLER :The New Aeron. Designers Bill Stumpf and Don Chadwick set out on a mission to create a chair that considers your health, is able to cross perform, and is environmentally friendly.